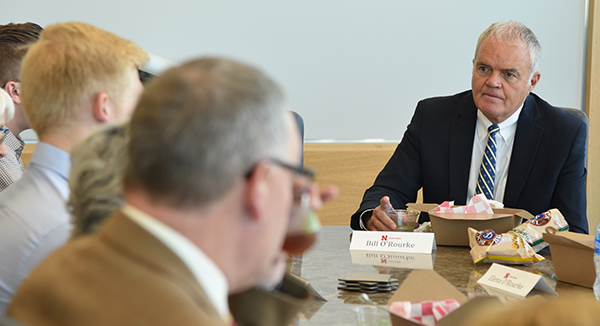 Following the lecture, Bill O’Rourke met with students, faculty and staff at a luncheon. More than 900 students, faculty and staff gathered throughout Howard L. Hawks Hall, in the auditorium and in several classrooms where the lecture was broadcast, to listen to O’Rourke share his experiences. Those watching heard of the vast number and variety of positions O’Rourke served during his 36 years at Alcoa, the world’s sixth largest producer of aluminum. Starting as a patent attorney, his ingenuity and willingness to take on increased responsibility led to a variety of leadership positions across different departments within the company, including president of Alcoa-Russia. When he served as the president of Alcoa-Russia, O’Rourke found himself in a new environment, putting his integrity to the test. He depicted times he faced ethical dilemmas, and his thought process through them. O’Rourke related stories of when he faced bribery and of the decision on whether to lie about an employee’s visa status. During his three-year tenure there, he managed to flip around the aluminum market, creating a strong foothold for Alcoa in the country, and reinforcing O’Rourke’s belief that holding your ground when it comes to your values pays off in the end. Sharing a positive recollection, he reminded students for every company you see make the news for unethical reasons; thousands of organizations stay out of the news because they are doing the right thing. Retiring from Alcoa in 2011, O’Rourke currently serves as the executive director of the Beard Institute in the Palumbo-Donahue School of Business at Duquesne University, where he teaches MBA students in strategy, leading change and ethics. Apart from his advocacy against texting and driving, the lasting impression O’Rourke wanted students to walk away with was the importance of following your own moral compass. As a result of State Farm Insurance’s sponsorship, the college has been able to host more than 15 speakers on business ethics topics throughout the lecture series, established by the Business Ethics Program at the college. Founded in 1998, the Business Ethics Program focuses on integrating ethics and the discussion of ethical issues throughout the college’s curriculum. The program also maintains a library of resources and coordinates the College of Business Student Ethics Board, which created the student-written CoB Student Ethics Code Scroll. For more information, visit: https://business.unl.edu/ethics.